For every designed object or product, engineers, smiths, and artisans keep in mind societal norms and taboos such as sustainable materials, tasteful morphology, tactile sensations, aesthetic concerns, health and safety, and cost that will largely determine if the object is desired or rejected by the consumer. Metal objects in prehistoric, ancient, and historical eras were conceived, designed, and produced within specific cultural contexts that dictated their usefulness and marketability, much as they are today. The design process is inextricably and intrinsically linked to culture, political economy, and ecology. An understanding of the cultural forces that have guided design constraints and ancient innovations is provided below for today’s innovators and engineers to be considered as a conceptual framework that interfaces society and materials. For anthropologists and historians, the study of technology is greatly aided by incorporating design theory and its outcomes. 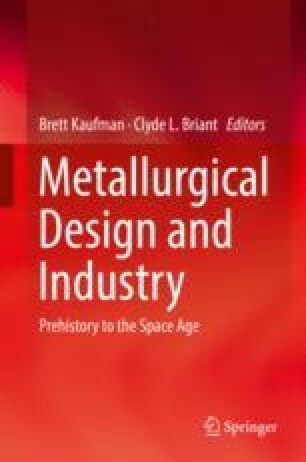 The following chapter synthesizes the fundamental material properties of human-selected alloys as both incremental and synchronic products of societal tastes, using a cross-cultural comparative approach to analyze the role of metals in the New and Old Worlds with a behavioral emphasis on materiality, surplus, and sociopolitical hierarchy. The result is, in part, a comprehensive archaeometallurgy reference guide structured as an anthropological design narrative compiling cultural, historical, and metallurgical information and case studies on non-ferrous alloys, ferrous alloys, precious metals, smelting and casting practices, surface and finishing treatments, and the ecological impacts of mining and metallurgy on the environment and human health. Thanks are due to the Cotsen Institute of Archaeology (University of California, Los Angeles), the Joukowsky Institute for Archaeology and the Ancient World (Brown University), and the Institute of Historical Metallurgy and Materials (University of Science and Technology Beijing). The author wishes to acknowledge assistance from the offices of the Fundamental Research Funds for the Central Universities of the Chinese Ministry of Education, No. 06102125. Gratitude is also extended to Clyde Briant, David Scott, Charles Stanish, Elizabeth Carter, Wei Qian, Kanji Ono, Haiwen Luo, Robert Gordon, Miljana Radivojević, Siran Liu, Hongjiao Ma, Kunlong Chen, and Janice Ngiam. Any errors or omissions are the responsibility of the author alone.